This morning for writing we did similes. A Simile compares two things using the words 'like' or 'as. 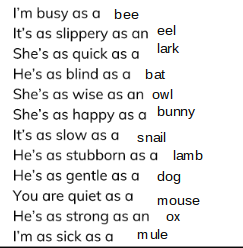 We had to match the animals with the simile that best describes them. For example I'm as busy as bee or you are as quiet as a mouse. This was very hard to work out but I think I got the hang of it at the end.